Ceil of Approval: Ceil Cirillo outside the RDA's Locust Street office. 'Redeveloping Santa Cruz' is Part 4 in our ongoing series on the political and physical reshaping of Santa Cruz since the dawning of the progressive movement and the establishment of UCSC, which turns 40 this year. For an arm of government that's been variously accused nationwide of stealing money from schools, stealing land from the poor and acting as what critics call "the unknown government," our local branch of the Redevelopment Agency (RDA) doesn't look like much: just an unassuming, single-story Victorian house sitting there all cute and green at the corner of Locust and Chestnut. Inside, a clean and quiet air of professionalism pervades. The house has been converted into a small office where eight people carry out the work known as "redevelopment" in our city. RDA executive director Ceil Cirillo runs a famously tight ship. As Councilmember Emily Reilly pointed out at a recent party celebrating the City Council's approval of the Tannery Arts Center project, those who work for Ceil really work for Ceil. 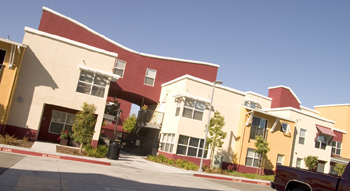 The stated purpose of that work is to eliminate blight, and in recent years the RDA has executed a diverse range of projects, including the Del Mar Theatre restoration, the development of Gateway Plaza, and 1010 Pacific Ave., the large salmon-colored retail and housing development that has sprung up opposite the Catalyst. Most recently, the RDA was the driving force behind both the failed Coast Hotel conference center project and the Tannery Arts Center project, which just got the City Council's green light. The RDA also runs a variety of economic stimulus programs, including graffiti abatement, facade improvement and business recruitment (see RDA project/program sidebar below)--all funded by an elegant tax mechanism that, despite its outward simplicity, few seem to understand, except that it has something to do with taking money from the state, or away from schools, or ... something. Critics say that RDAs are too powerful, that their newly reinforced powers of eminent domain should be rescinded, that they should be scaled back and the tax money that funds them diverted to schools. Proponents say RDAs don't affect schools and represent the only budgetary answer to the great sucking sound of Proposition 13, the 1978 initiative that hamstrung local government's ability to provide for its citizens. Meanwhile, the agency continues its work on some of the most fascinating and controversial economic development projects in our city. Our story starts with RDA opposition and a report titled "Redevelopment: The Unknown Government"--probably the most widely circulated anti-redevelopment missive. Published by Municipal Officials for Redevelopment Reform (and funded by the Fieldstead Institute, which the Notable Names Database characterizes as a "right wing reconstructionist think tank"), the RUG document portrays RDAs as fat, cigar-smoking, middle-aged shysters who bulldoze towns and hand them over to favored developers and bond brokers. Listed on the editorial board of the RUG pamphlet is real estate developer and former school board member Doug Kaplan, who lives in Pajaro. Kaplan has been waging a long campaign against RDAs ever since he discovered how easily they can borrow money without voter approval, while struggling school districts have to beg for it. County auditor Gary Knutson says Kaplan is right in the sense that once an RDA successfully establishes a project area, it's relatively easy for it to borrow money against future property tax increases--especially in Santa Cruz, where Knutson says property values rise at about 6 percent a year. What's less clear is whether or not RDA money has anything to do with school money--both of which come from property taxes. The simple answer is that, on a local level, schools are not affected by RDA activity, because the state guarantees school funding on a per capita basis, thus indirectly subsidizing the 384 active RDAs in California. "When Prop. 13 rolled around," says Kaplan, "the cities and counties woke up and realized they could use the RDAs to generate revenue for the community in the form of sales and [transient occupancy] taxes. They said, "We have these extra powers in the form of redevelopment; let's use them to take property that's not blighted, but that's in prime retail location. We'll use [redevelopment money] to generate sales or [transient occupancy] taxes, and now you see Wal-Marts and Costcos subsidized by RDAs down south." "What the RDAs do," continues Kaplan, "is take the decisions about what types of homes and businesses the public and marketplace want out of the hands of people and business owners and put it into the hands of a government agency. What you end up with is a government agency centrally planning a community, rather than having it evolve according to what people want over time." To be sure, some RDAs have employed the strategies Kaplan outlines, but local officials maintain that it hasn't happened here. Mayor Mike Rotkin says our RDA ploughs money that would have gone to the state back into community improvements. He admits that there exists a potential for RDA abuses in other cities, but claims it can't happen here. "You do have situations where there's out and out corruption," says Rotkin, "but it's more often when the board is composed of all business people, and there have been cases where the RDA sees its job as lining the pockets of their friends. Whereas I feel very strongly that basically the RDA is full of people who are trying to figure out how we can maximize returns to the city's general fund." Cities have of course been seeking creative ways to grow their general funds ever since Proposition 13 limited property tax growth in California to 1 percent in 1978. Cities and counties have established RDAs to help them improve what county Treasurer Fred Keeley describes as "underperforming areas." Here's The Plan: Now, if we could only remember which plan is the one we're looking for. The reason lead agencies like cities or counties are interested in having RDAs, according to county Auditor/Controller Gary Knutsen, is "as a way to address their infrastructural needs largely at the expense of the state of California." Community RDAs spring forth from the California Health and Safety Code, which is boring to read but describes a surprisingly basic architecture. Simply put, RDAs are designed to assist county and city governments in improving the physical and economic conditions in areas designated as "blighted." The definition of blight, detailed in section 33031 of the California Health and Safety Code, is admittedly vague, but includes physical instances, such as dilapidated buildings, and economic instances, such as a lack of necessary commercial facilities normally found in neighborhoods. The financing mechanism is also simpler than it sounds. Called Tax Increment Financing, TIF works on the assumption that RDA activity increases property values in a blighted area, both directly and by stimulating more private investment in the area. As property values in a project area rise--presumably due to RDA activity and investment--the RDA gets a portion of those rising property taxes. If property taxes don't rise, RDAs get no money. Funding is thus, in theory, tied to performance. 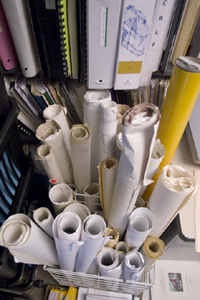 Before an RDA can establish a project area, it must negotiate "pass-through" agreements with other local tax jurisdictions, such as the city, the county, fire departments and libraries. These agreements require an RDA to pass a negotiated percentage of the tax increment on to those jurisdictions. According to Keeley, these are "bilateral, fair negotiations." Furthermore, thanks to AB 1290, which passed in 1994, local tax jurisdictions get a a minimum rate of about 33 percent of the tax increment. RDA assistant director Joe Hall says the agency will gross about $7 million in 2006. Of that, $2 million goes directly back to the county and schools, and $2 million will go to affordable housing projects, leaving $3 million for capital projects and staffing. Asked to evaluate the concept of redevelopment from a fiscal standpoint, Keeley says that, while people can disagree relentlessly about individual applications, "redevelopment has a lot of virtues as public policy architecture." "Without raising taxes," says Keeley, "it's a way of keeping more of what people pay in taxes under local control." Prior to his vote on the state budget, Assemblymember John Laird echoed Keeley's sentiment. "I think, when properly done, it's a good thing for California statewide. ... Overall, the benefits that come from redevelopment outweigh the burden [on the state]." Who Does No. 2 Work For? 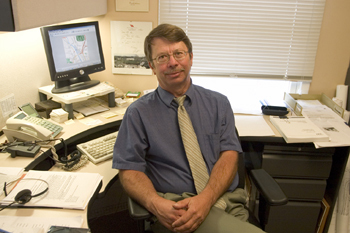 : Former City Planner Joe Hall was recruited into the city's Redevelopment Agency as assistant director in 1999. "RDAs," says Gary Knutson, "are, in theory, a creature of debt: you sell bonds, take those bond proceeds, get your projects done, pay off the debt and go out of business." Here in Santa Cruz, many believe that our RDA was established in the wake of the 1989 Loma Prieta earthquake. As it turns out, the Santa Cruz RDA was originally formed as an independent agency 34 years earlier, one year after the flood of 1955 wiped out Chinatown and damaged much of the downtown. In 1982, its work completed, the RDA was phased out as an independent agency, its operations disbursed among city departments, its finite life span embodying the theoretical ideal of RDAs as described by Knutson. Since the 1970s, a lot of energy has been spent protecting the environment in Santa Cruz. In a very real way, that's meant stopping economic development projects, many of which, had they come to fruition, would have literally changed the landscape of Santa Cruz. Part of the legacy of those struggles is a vocal distrust of real estate development as a means to economic development. That distrust was trumped by necessity after the earthquake, when the need for reconstruction help was felt by most of the community. 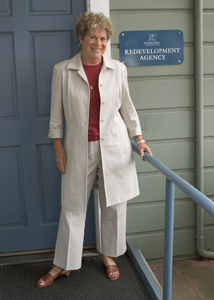 "After the earthquake," says District 3 Supervisor and former Mayor Mardi Wormhoudt, "we decided we needed a heavy-duty redevelopment agency, because we would never put together all the funding that was needed for the city's contribution to make all this happen without that. ... So we went out and hired who we thought would be a really, really aggressive redevelopment director, Ceil Cirillo, and she had a great track record in Southern California of making all kinds of development projects happen." Cirillo quickly cast a wide net across the newly blighted city to guarantee future tax revenues. Typically, RDAs borrow against those future tax dollars to fund redevelopment now, and the Santa Cruz RDA is no exception. When the RDA came online in 1990, it was immediately able to begin helping downtown property owners--many of whom had no experience developing property--to find tenants, loans and negotiate the complex permitting and approval process. The RDA helped create Vision Santa Cruz, the 36-member planning group representing public and private interests that organized the recovery of downtown. Cirillo aggressively pursued movie theater complexes and restaurants as potential downtown tenants in an effort to attract more people in the evenings--a strategy that many worried would doom the Nickelodeon, but that some Vision Santa Cruz members now consider the single most important factor in the recovery of downtown. But now that the earthquake is, except for two holes in Pacific Avenue, mostly a fading memory, anti-development sentiments are coming back in style. "I would say," says Wormhoudt, "that maybe it's time--and again, this has nothing to do with Ceil, I like Ceil--for the city to revisit, OK, we needed to create this huge redevelopment effort after the earthquake. Is it appropriate now, 15 years later?" The answer to that question is complex. Many of our RDAs' activities go unnoticed precisely because they aren't controversial. The RDA carries out infrastructure improvements, façade improvements, security deposit and emergency rental assistance, subsidies of 442 low and very low rental units and they've procured $15 million in federal and state grants for downtown parking, Beach Street and river levee improvements--none of which grab headlines. Also, what constitutes a "huge redevelopment effort" is debatable. For instance, the county RDA, whose board of directors is the board of supervisors, has a budget triple the size of the city RDA, encompasses the unincorporated area between the cities of Santa Cruz and Capitola, and is working, among other projects, to build a library in Live Oak. A common local refrain trotted out against city development efforts is that they don't represent the values of the people of Santa Cruz. Such was Ralph Myberg's contention in the case of the doomed Coast Hotel project, which Myberg opposed. Santa Cruz Mayor Mike Rotkin levels the most obvious rebuttal to that argument, which is that the RDA's Board of Directors is the City Council, who are elected by Santa Cruz citizens. "It's not like we're from Mars or something," says Rotkin. "The Redevelopment Agency has a very clear mission: find a way to make sure we get money in our general fund, and build affordable housing." As part of their charter, RDAs assist private developers through tax incentives, subsidies and, in some cases, land acquisition. On the Tannery Project, the RDA will purchase the land from the Lezin family for $6 million and lease it to the Tannery Arts Center--the nonprofit formed to develop the project. But late last year, the City Council, acting as the Redevelopment Agency, initiated eminent domain proceedings on the lot at the south end of Pacific Avenue, which has sat vacant since the 1989 quake, and which belongs to local visionary Ron Lau, who expressed plans to build an eco-friendly mecca. The situation has been sticky, mainly because the council decided to grant another extension to Louis Rittenhouse, a former councilmember and established developer, who owns the empty parcel at the corner of Pacific and Church. Why one and not the other? The mayor maintains the decision was not discriminatory, but was based on Lau's failure to outline a plan and stick to it, whereas Rittenhouse has presented completed plans, and need only find a tenant to proceed. But the situation has just gotten stickier. Two weeks ago, the U.S. Supreme Court ruled that local governments can seize property from one private owner and give it to another for the purposes of private economic development. In her dissent, retiring Justice Sandra Day O'Connor wrote, "Nothing is to prevent the state from replacing any Motel 6 with a Ritz-Carlton, any home with a shopping mall or any farm with a factory." In a July 7 Alternet article, David Morris points out that states and local governments can still impose limits on themselves--and in fact, in the state of California, they already have. Morris writes, "A 1976 California court opinion describes their approach. Eminent domain 'never can be used just because the [city] considers that it can make better use or planning of an area than its present use or plan. ... [It] is not sufficient to merely show that the area is not being put to its optimum use, or that the land is more valuable for other uses to justify condemnation of property." Even still, the RDA can use--and has used--eminent domain on blighted property to put together the pieces that would form River Street Gateway Plaza. Despite some controversy, Cirillo says that the matter never went to trial, that the only obstacle point was how much money the property owner would be paid. Then-Councilmember Celia Scott, the only member who consistently opposed the project, did so primarily on aesthetic grounds, telling this newspaper in 1997, "I would have liked to have seen something other than the traditional model ... I don't like driving down freeways and seeing big-box structures." In her own defense, Cirillo points out that while RDAs around the state are vying for big box stores like Costco and Home Depot, she doesn't believe in, nor has she personally advocated for, their location here. "When Costco first came to the community and wanted to locate here," says Cirillo, "I told them at that time we would not provide them with any subsidy, and they still came." "I have tried to work within the community values," says Cirillo, "and every now and then bump up against them--the Coast Hotel project was one that I faltered on, and it was a disappointment because I brought it to the council several times. I asked them, 'Do you want us to continue to move? Because we're spending a lot of money.' And each time they said, 'Yes.'" "That reflected my style," says Cirillo, "which was: don't spend unless the council is with you. And I thought they were." 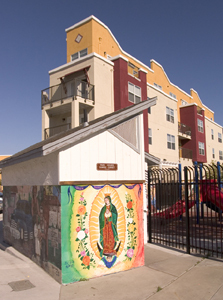 Follow the Money: The Leibrandt Street low-income housing project is just one of the RDA's affordable housing efforts. In these days of budget crisis, economic planning is all the rage. The city is working to develop its General Plan with economics in mind, and Councilmembers Tony Madrigal and Tim Fitzmaurice are in the process of organizing an economic summit to drum up more ideas on how to deal with the city's budget crisis. "We know that the two economic engines in the city are the university and tourism," says Cirillo, "and the important thing is for all of us to identify how best to work with those two economic engines while retaining the quality of life that people want here in the community." In that vein, the RDA continues to work on workforce development and job training by funding job training skills programs at Cabrillo College. But Cirillo says the project with the most potential to address some of the long-term economic visioning for the region is the technology-transfer project the RDA is pursuing at the old Texas Instruments building. "We want to work with the university in identifying what kinds of business might be grown from the research and development that occurs on campus that can grow in this community and become part of our economic base." The RDA has commissioned Cliff Warren, former CEO of Raytek, a locally based thermometer manufacturing company, to recruit high-tech companies into Santa Cruz. His project has two main phases: identify, through interviews with public officials, bankers, real estate agents, public and private schools systems and citizens-at-large, what Santa Cruz has going for it that would make it attractive for high-tech startups; then go out and recruit. Regarding development in town, both Cirillo and Rotkin agree that Front Street could use some work. Lofty plans still exist for a riverfront plaza surrounded by cafes and shops, with housing above, overlooking the river. "I think there's huge redevelopment opportunities on Front Street," says Rotkin. "All those cinder block buildings, they all turn their back on the river. I think the RDA could play a real key role in developing Front Street as a riverfront kind of place, with upper story housing, people making much more active use of the levee. I think RDA could play a key role in that." Wormhoudt isn't so excited about the prospect of future RDA projects. "Because," says Wormhoudt, "if you have a huge redevelopment agency like that and a very high-powered redevelopment director--and I assure you, this is no criticism of Ceil, it's her job, and she's good at it--but, someone like that is going to go look for projects to do, right? That's what redevelopment directors do." "We've done a lot," says Cirillo, "but I've been here a long time, too." Unless state legislation changes, the Santa Cruz city RDA will automatically deactivate in 28 years. "By the time the plan expires," says Cirillo, "presumably there will not be significant blight left ... a least nothing of substance that would warrant renewing or extending the project areas." Asked if she'll be out of a job in 2033, Cirillo laughs and says, "Much sooner than that."